Buck Steinke and Ken Farmer have mixed up a new, thrilling Black Eagle Force novel. I am in awe of how they can find more and different stories to keep us entertained. Bringing back a well-known historical character (can’t spoil it for you) is a stroke of genius - or two geniuses. These writers are masters at weaving a tale that is believable and interesting. Actually, there are a myriad of adjectives that describe the works of Ken Farmer and Buck Steinke. I just don’t have enough room in this review to use all of them. 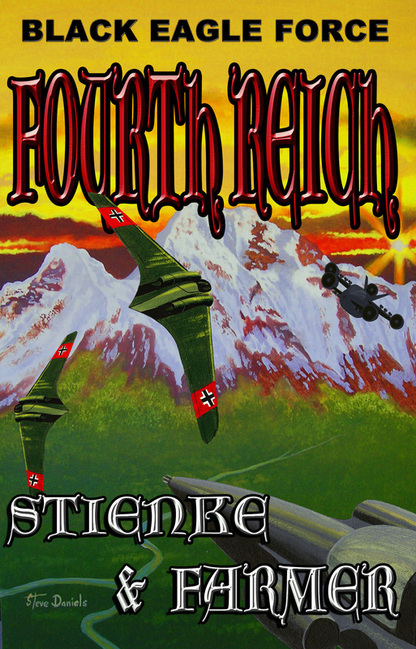 Fourth Reich has all of the normal excitement, technology and romance we have come to know in their earlier BEF novels with some added surprises. A short history of the end of WW II reminds us of the kind of people we are dealing with and surmises what might have happened one day so long ago. They show us what might happen if scientific inventions were developed by the wrong people. Could this be a warning? You will not go wrong in reading “Fourth Reich”. There are new surprises and technology that will make you shake your head in wonder at the fertile minds of these talented writers. When the small US Air Force C-37 Gulfstream carrying the Secretary of Defense, Harold Baker, to a meeting in Argentina, is shot down over Bolivia, the BEF is called in to look for them. The story then takes on a life of its own. The survivors teach each other how to exist in the primitive circumstances and the BEF troops use their technology to find them. But, they were shot down in the middle of a secret operation that you will have to read to believe. It could be described as the conspiracy to top all conspiracy theories. Buck Stienke is a retired captain and fighter pilot for the United States Air Force and a graduate from the Air Force Academy. He was a pilot for Delta Airlines for over 25 years and also executive producer of the award winning film Rockabilly Baby. Ken Farmer served in the Marine Corps and graduated from Stephen F. Austin State University. Ken has been a professional actor, writer and director with memorable roles in Silverado, Friday Night Lights and Uncommon Valor. He continues to write and direct award-winning films, including Rockabilly Baby. I have been privileged to read all of the Black Eagle Force novels by Buck Stienke and Ken Farmer and comment on them. 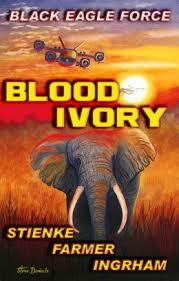 In my opinion, Blood Ivory is the best, so far. I don’t know if it is by accident, the premise, their learning curve or the addition of a third writer, Doran Ingrham, or all of the above. You can make up your mind when you have read it. You will not be able to put it down until you find out what happens. At the same time, the honeymoon trip of the President’s two sons and their wives on the maiden voyage of the Royal Pleiades, the largest cruise ship in the world, is abruptly brought to a halt with a hijacking in the Indian Ocean. The ship is hi-jacked by al Queda and Somali pirates and the intrepid BEF agents work to get the ship back. (Not a spoiler here, either, we knew it was going to happen.) Read how the BEF agents foil the plans of the perpetrators with some BEF tactics combined with some MacGyver devices. President Annette Thompson, the mother of the two grooms, calls on the BEF to help with handling these predicaments. Thus begins the beginning of the end – or does it? Do the two stories merge or not? You will have to read the book to learn how it all happens and the end result. You will feel as if you are a member of this elite force as you follow the BEF on another exciting clandestine mission (or two). Doran Ingrham’s former life included the USMC, Risk Management/Close Security Specialist and extensive experience dealing with terrorists. He has appeared in commercials, TV and films. He now lives with his wife in an undisclosed location. Shots ringing out from the brush signal the beginning of Haunted Falls, the second book in the Ken Farmer and Buck Stienke series of western novels. The stories follow US Deputy Marshall Bass Reeves and his cohorts as they fight to keep peace in the Indian Territory of the late 19th century. Bass Reeves and Jed Neal join another legendary lawman, US Deputy Marshal Selden Lindsey as they hunt the last survivor of the infamous Dalton gang, Bill Dalton. They’re also trying to find out what happened to one of their undercover deputies and Bass' long time partner, Jack McGann. They didn’t know Jack had been shot in that first fracas and presumed dead, but by a strange twist of fate, he survived. 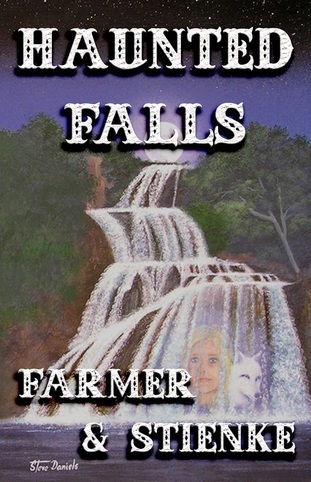 Jack’s journey takes him to a haunted falls where he meets a little girl and a white spirit wolf of the Chickasaw tribe. This meeting creates a mystery that will baffle the reader all the way to the end. What follows is the archetype of the old west. You will be spellbound by the action, adventure, romance, tragedy and even humor. Often a sequel is not as well received as the first book in a series. In this case, Haunted Falls is as good if not better. You will have to read it to make up your own mind. I have made up mine. Buck Stienke and Ken Farmer are the authors of the best selling and award winning Black Eagle Force series of books. They both have military backgrounds and have worked as actors, directors, producers and screenwriters. Now they’ve turned to writing novels. They describe themselves as “Faction” writers, shown best in their Bass Reeves novels. Publication date is June 18, 2013. 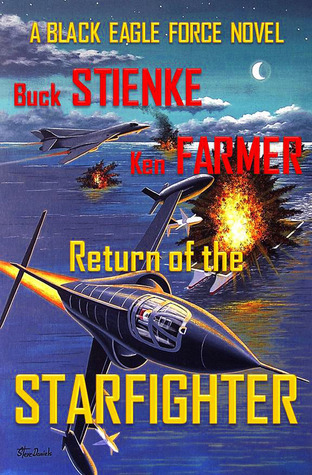 In Return of the Starfighter, authored by Buck Stienke and Ken Farmer, The Black Eagle Force is called in to another action thriller mission. This time they are called on to save the country from the invasion of a group of rogue Chinese. To accomplish this, the “Old Iron” (retired, but usable aircraft) is retooled and brought out of mothballs. Led by General Jack Stewart, a force of older and retired men from all the services are called in to fly in this new/old squadron. Then, the BEF is called in …. Since we know that the BEF is invincible, there is no reason to go into any details, just suffice it to say that the action is exciting and not predictable, as is the wont of Mr. Farmer and Mr. Steinke. This is another great read for everyone. In this, the third of the BEF novels by Ken Farmer and Buck Steinke, we again meet with old friends of the BEF, Dare, Blaze, Mickey, Jill and Gunter Hermann who is now married to the President of the United States as well as other familiar air warriors. Do they all survive the turmoil in which they find themselves? No spoilers here, folks. Often, by the time an author gets to the third (or even the second) in a series, they have run out of new scenarios to make a believable storyline for us to become enthralled with. Not so with these two bon vivants of military novels. They continue to entertain us and make us believe that a clandestine group such as the BEF is possible. Maybe it is? Who knows – its top secret. The Black Eagle Force becomes embroiled in another exciting adventure written by authors Buck Steinke and Ken Farmer in Sacred Mountain. This time it is really personal. Annette Henry Thompson, the first woman to be president of the United States is kidnapped by a former enemy. She is the former love of Gunter Hermann and therefore very important to the BEF team. A few seconds passed before a short message came back across the MMILSATCOM link. With this unexpected revelation, the BEF is called into action by Secretary of Defense Baker to go deep into the Sierra Madre Mountains to find and rescue her. What follows is the masterful way in which they execute the mission. You will feel like you are sitting in any one of the aircraft described by this masterful writing team. There are some other surprises about people you know from the news. You need to read this book to continue following the BEF adventures. 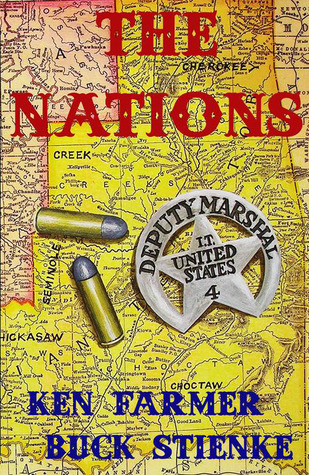 The Nations by the Ken Farmer and Buck Steinke writing team of the Black Eagle Force series has headed into the old west with a very exhilarating story about Marshal Bass Reeves, the first black U.S. Deputy Marshal. In 1885, the gang known as the Larson Gang terrified Arkansas, Missouri and The Nations (Oklahoma Territory) until they were challenged by Judge Isaac C. Parker by the arrest and sentencing of the youngest member, Ben. The story takes us (yes, we feel as if we are riding right along with the Deputy Marshals) on their trip fraught with danger and death to deliver Ben Larson to his hanging. It is within this story that we are entranced with the rich history and a small part of the record of the U.S. Deputy Marshals, principally Bass Reeves. They relate both his sense of justice and tenderness toward family and friends. We are caught up in the time and place as if we are there. I know you will become a fan of the Farmer-Stienke team if you are not already one. This is a little detour from their former works, but it is still packed with fascinating excitement – just in a little different era. Another hit for the team! Ken Farmer and Buck Stienke have teamed up to write an exciting, adventure-riddled, subtly romantic book entitled Black Eagle Force; Eye of the Storm. They begin the story with a history lesson – how Santa Anna came across the Rio Grande to San Antonio and the Alamo. This short lesson is actually personalized by naming the owners of a large ranch that the Mexicans had to go through to reach that part of Texas in the fight for Texas Independence. Fast forward to modern times. The family of the 1836 ancestors still lives on the ranch. Gunter Hermann, the patriarch and father of Mike and Blaze, keep the ranch operating with the help of several employees. Another war is in the making. This war is still with Mexicans, but there is a different reason for it. The reader is carried along with the characters, both good and bad, as they become embroiled in a spine tingling adventure that will keep the reader wanting more. Some readers will be put off by the pages of technical information about vehicles, airplanes and guns, but the information gives the reader insight into how intense the situation is. Will the ranch family get help to protect their ranch? Tune in to find out. I liked the plot and the characters. The plot is well thought out and executed and the characters are well defined and interesting. I believe that the novel is written so that it could be adapted to a movie or TV miniseries. Let’s hope that if that is the case, they will keep the character of the book.